Is The 500 Cash Club a Scam? Why It’s Just a Fake Site For Another Program. Price: About $50 bucks and up to $60,000 in total price tags if you buy whatever else follow (yeah it’s insane stuff, but I’ll explain why that number is no joke). Overall Rating: 1 out of 10 stars. I don’t know how I keep stumbling onto these scams, but it happened again. This program isn’t real, it’s a fake site that REDIRECTS to another fake site and that one redirects you to a big, expensive program (where the charges can get as high as $60,000, if you go that far). Just yesterday, I did a review on a program called Extreme Home Paycheck, and proved it was a fake site because it redirected me to a program called Automatic Daily Income and that too was basically a “fake” because that just tried to get me into a high ticket program called MOBE, the TRUE program behind ALL of this stuff. 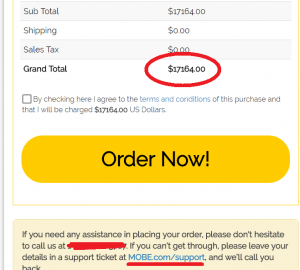 Now MOBE is a very expensive, high ticket program. And in case you don’t know, high ticket programs are basically places where you enter for a small price (About $50 in this case), to learn about things like online business, then as you progress further and further, the prices to keep learning get higher and higher. Anyway, I said that Extreme Home Paycheck was just a fake site trying to get me into MOBE (which I did, but that was before I knew better). 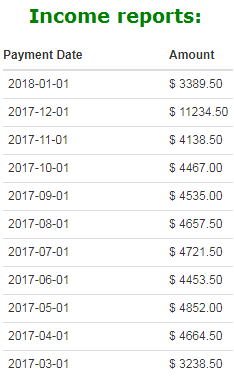 So where does the 500 Cash Club come into play here? If you replace every word above where I mentioned Extreme Home Paycheck and replace it with 500 Cash Club, you basically get what it is. It is literally the same thing as that fake site (it’s also fake), because it does nothing but redirect you into Automated Daily Income and as you already know, that redirects into MOBE. It’s just a form of secretive, back door, and in my opinion, deceptive marketing all to get you into that high ticket program and to possibly have you spending a ton of money, all while providing the creator of the fake sites a hefty commission. And a lot of people have jumped into that, including me, and I’m an experienced guy with these types of tactics too, so you’d think I’d know better, yet they got me too! 1) You must sign up for MTTB, which is basically the first part of the MOBE program. That costs $49. 2) You must go through 21 steps within the MTTB program, where after step 6, you have to pay $2,000+ to move forward, so that already makes that guarantee (even if it still exists) already a loss even if you are eligible to get it. 3) Plus you also have to prove you did the 21 steps. Now the point of this whole thing is that I review make money online programs (here’s the best program) and numerous times whenever I saw a $500 figure or number, it was typically associated with MOBE. It’s just been awhile since I’ve run into this program, so I guess I lost my memory. “Thankfully” this review and experience reminded me of the whole thing again. The 1 star rating and this review as a whole is on the 500 Cash Club site, not on MOBE, and not on MTTB. Yeah, that’s really a price tag of over $17,000 and it’s one of the big ones within the program. And while it is important to mention that this is an OPTIONAL purchase and no one is ever forced to buy these, the catch is that if you do get this up-sell for example, that you can become an affiliate for it and earn $1,000’s in commissions if you sell it per person. But the point is, if you go through 500 Cash Club, and into MOBE, you will eventually see these offers being pitched. What you get besides the option to promote them, is a lot of education in online marketing. Final Rating: 500 Cash Club. 1 out of 10 stars. 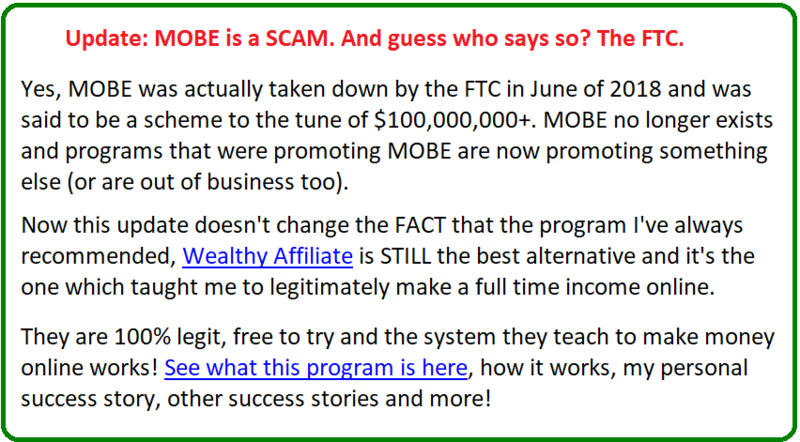 The site itself is a scam, it offers nothing but a link into Automated Daily Income and that is a link into MOBE. Again, this rating is directed to 500 Cash Club, not MOBE as a whole. At this point, I wouldn’t be surprised if I kept finding more and more backdoor sites like this. It’s almost like a norm now for me. I’d say, with this recent review, it’s like the 10th site I’ve stumbled on that tries to get me into MOBE. There’s few which offer good education. MOBE is one of them, but it is so expensive to find out the info inside it, that no matter how much it offers, in my opinion, it just isn’t worth it, not for buying it, and not for promoting it and having people spend that much. And I know the program I recommended will not only cost you way less, but it’ll teach you more than you can imagine to make a living from home and I say that because I managed to do that through them. Now that we’ve figured this whole 500 Cash Club out and what it really is, I want to ask that you guys tell me if you see any other programs (fake sites) like this now or in the future, so I can review them, thanks! Thanks for reviewing the 500 Cash Club. I’ve come across one of your reviews before about another scam (the name I don’t care remembering). Thanks for looking after people like me who only desire to learn and make legitimate money online but would get fooled by something like the 500 Cash Club, if not for your review. Keep those reviews coming to put a stop to these people! Thanks again. Thank you for bringing up this website to warn us. I have never heard about 500 Cash Club nor Extreme Home Paycheck, but one of my friends is involved with MOBE and I know quite a bit about it (I attended IMF as well). They teach traffic (mainly paid ads) and I wonder if it is one of their tactic? (That would be really bad!). I won’t call MOBE flat out SCAM but if these marketers try to use some sneaky tactics to get innocent people into MOBE, its reputation would go down the hill. Their payout is indeed really great, and therefore some scammers would jump right into something like this. I almost got involved with his program when Matt Lloyd said with the traditional affiliate marketing you will make only a little money. There are many online marketers nowadays that do strategies such as a sales funnel into high ticket items. What do you think about this direction? I am completely NOT a fan of that approach, because typically that strategy is used to promote overpriced make money online products. I have never promoted a high ticket item in the make money online niche and I likely never will. I am however for promoting high ticket items in legitimate niche topics (gaming computers, cars, tractors, ect…) but only if the value and price are fair for the consumer. Of course it is completely up to any company what they want to charge for their services. I do however think these prices are ridiculous. And I really dislike when it is so difficult to find out what the exact price will be until after you join a program. I hate these upsell tricks where you get started cheaply and then as you get more and more involved and already have invested time and money, the prices just keep rising. In my opinion this is not a fair way to do business. Thanks for the warning and for making it clear what 500 Cash Club really offers. Yeah I hear ya Mikael. I think your perspective on people become more and more chained to the program as they become more invested in it is a great point, as was your original point on how businesses can make their own price points, but let’s be reasonable here, there’s a limit! I certainly have the right to write a single lesson on making money online, charge $1,000 for it and then tell people to promote it, but this is ridiculous when someone else can write the same type of thing, and give it out for free. That’s why I tell people to join Wealthy Affiliate, because its education eclipses and in my opinion bypasses MOBE in just about every way (and of course, they can do it for free).